If you're a fan of Nirvana, Alice In Chains,Pearl Jam or anything similar then look no further for your new favourite band. 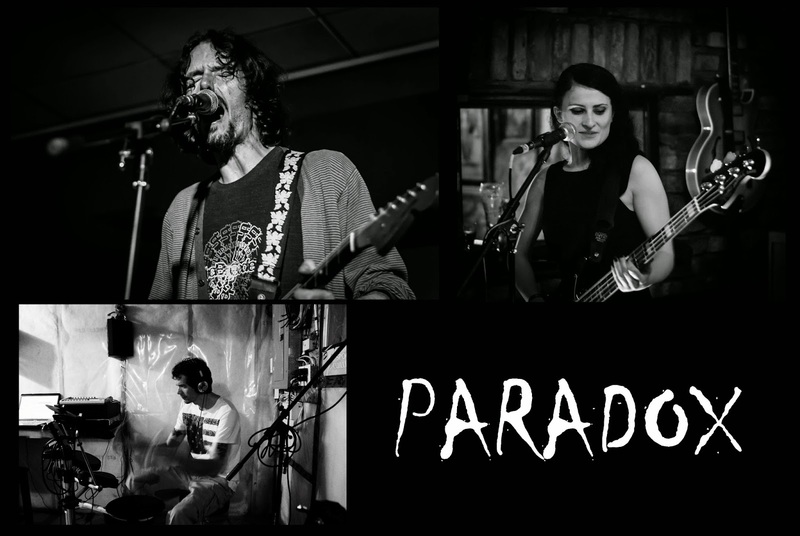 Straight out of Cork, Ireland, Paradox are keeping grunge well and truly alive. Following is an interview I got with Paradox lead singer, Pete Mac. What are your names and what do you do in the band? Pete: There's three of us in the band. There's Jette who plays bass, Mike who plays drums and me,I'm the vocalist and I play guitar. How did the band form ? When did you all meet? Pete: The band was formed in 1996 by myself and my brother [Mike the drummer]. We have been playing music since we were kids and eventually we just decided to form a band. Obviously just being me and Mike we never had a bassist anytime we were in the studio. I think in our band lifetime we've been through about eight bassists. Jette joined us in 2010 for when we did a small UK tour, she's been with us ever since. What genre of music would you define your band as? Pete: I'd say a mix of alternative Rock, Grunge, Post Grunge, Punk Rock, Progressive. With that list of genres being quite diverse, you must have quite a mix of influences? Pete: There are quite a few but the main ones from when we started playing are bands like Nirvana, Alice in Chains, Soundgarden, Silverchair, Pearl Jam, Sonic Youth, Smashing Pumpkins. What inspired you to start playing music? Were you brought up on it or was it more of a 'music found you' moment? Pete: Music to me is freedom from the outside world, like an escapism from everything, good and bad. Like any art form it's a way of expressing yourself. My older brothers used to listen to eighties metal such as Guns n' Roses and what not so I've always had music in my ears since I was bout five or six. I'd say I really discovered music in 1991, the first time I heard Teen Spirit. I was nine or ten years old and when I heard Nirvana and like many other kids back then it felt like I had found my calling, definitely an epiphany moment. Through Nirvana I discovered so many other bands that seemed authentic and had an energy about them that I wanted for myself. I started playing guitar and writing songs in 1994 not long after Kurt passed away. Needless to say Nirvana and pretty much the whole Grunge scene was my foundation in discovering music. Who writes your songs and what influences your songwriting? Pete: I write the majority of the songs. Mike sometimes writes them with me but obviously he always writes the drum parts. The songs are mostly about personal experiences, stuff that annoys us and politics as was the case for a few songs off our last album [Corporate Pollution and Mr. Bureaucracy]. One track from our new album [Eat] however focuses on the treatment of animals in factory farms and was inspired initially by the documentary 'Earthlings'. Pete: Quite a bit I would say, well I hope it has at least. When I listen back to our first album it sounds a lot like 'Mudhoney' or 'Bleach', we were eighteen and wore our influences on our sleeve. We've always been a fan of harmonies and Cello which has made it's way more and more into our music over the years. I like to have a balance of hard rock and folk acoustic music. As long as in my eyes it's alternative, can't really say I'm a fan of any daytime radio music or pop. As a band, what has been your biggest challenge? Pete: Being musicians and playing music DIY style. It's hard to find an income as a musician, nowadays it seems having your music placed in a McDonalds or on a Vodafone Advert is the only way to make money which is kind of sad. Any money we've made over the years has in one way or another gone back into the band, for example studio time and so on. I guess you just have to play music for the right reasons. Since you've been together for coming up to nineteen years you must have played at some awesome places, what's your favourite venue you've played at? Pete: Top of the list without a doubt is 'The Sage Club' in Berlin, Germany. We played there in 2006, it was one of them full house club gigs that seemed to go on all night, we were the only band with a full Alternative night club running after. The 'Crane Lane Theatre' in Cork also has a lot of memories for us, as does 'Cyprus Avenue', another one in Cork, Ireland. We played 'Sir Henry's' in 2001 which was awesome, it was a historic music venue and club in Cork that hosted Sonic Youth and Nirvana back in 1991, sadly it's now closed and has been converted into a car-park. Pete: Play music for the love of music and not with the idea of becoming famous, don't compromise your music or ideals to suit what's popular at the moment, play music you feel best represents you as an artist. Be persistent and don't give up too easily by any rejection and ignore negative reviews and opinions as that is all they are, opinions. Pete: At the moment we have three shows playing the music of Nirvana. We did something similar last year for the 20th Anniversary of Kurt Cobain and it was such a success we decided to do something similar again this year. We're playing Saturday April 11th 2015 at DeBarra's Folk Club, Clonakilty, Friday April 17th 2015 at Cobblestone Joe's, Limerick and Saturday April 25th 2015 at Crane Lane Theatre, Cork. All free admission.